This piece originally appeared on Needsupply.com. While not an enclave, per se, the Northern Beaches are a little ecosystem unto itself, with a wholly different character than the city at large. Although it is reputed to be an exclusive playground for the rich and famous, it’s mostly just a really nice place to be and a living icon of Australia-as-dreamscape. With places named after both calculus proofs (Dee Why) and apparent machismo (Manly), there is clearly an interesting and eclectic mix of people and ideas about. For lucky number 7 in our Go Explore City Guide series, we take a look at this mecca of ripped bods and beautiful homes and to-die-for beach scenes. Even though she currently calls L.A. home, we took a walk in the sand with one particularly noteworthy Northern Beaches native, stylist Imogene Barron. I’m an Australian freelance stylist, creative director and publisher of Junk Magazine. I live in Los Angeles. What’s life like in the Northern Beaches? It’s a pretty magical place, the beauty is beyond, it’s a peaceful place and a quiet way of life. What took you there? When did you first arrive? I grew up there hence it holds a very special place in my heart. Where’s the best breakfast spot? The Boathouse, a waterfront café situated on Palm Beach, the view is spectacular as is pretty much everything on the menu. Just try and avoid the weekends. How about your favorite coffee spot? Franks Café in Avalon. Australian coffee is the bomb. What’s your perfect day in the Northern Beaches? My friends have an old tree house right by the beach, I am fortunate enough to stay there whenever I’m home, the house is basically my dream home, waking up in what feels like the jungle is the absolute best, next it would be packing a picnic and heading up to the Palm Beach lighthouse. I have a secret path that situates me on the edge of the cliff, it’s my happy place. Once back down the beaten path I’d call my dad to pick me up and head out on his boat for a sail around Pittwater. Which is your favorite neighbourhood? Avalon. A sleepy little town 11 months of the year, then mayhem for the Christmas/ NY period. It’s really interesting to watch the transformation and the hoards of people that frequent it over the Summer. The people watching is excellent. Where do you go (and what do you drink) on a weekend night out? It’s far from a party town. If I feel like being decadent, it will be dinner accompanied by a few bottles of wine. Jonahs and Barrenjoey House are my favorites. However normally it’s just a quiet beach BBQ watching the sunset with good company, a bunch of beer, and good ol Aussie snags. Nothing beats it. What should you pack for a summer (winter for us!) trip there? Swimmers, beach umbrella, picnic basket, camera, sunscreen, towel, your bare feet and beer. 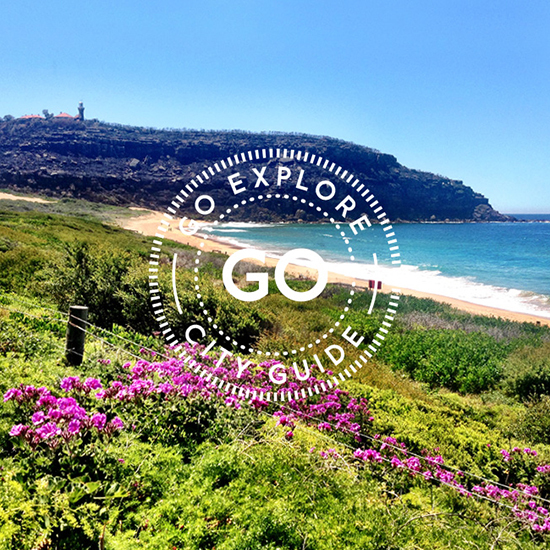 What sets the Northern Beaches apart from anywhere else on earth? It really is one of the most beautiful places I’ve ever seen. Huge thanks to Magda Tomaszewski and Kasia Dybalski for the Northern Beaches trivia.